Pre-Order With Immediate Free Download Cover Of FAITH NO MORE's "Epic"
Vancouver, BC based Rock/Metal band THE VEER UNION has started a PRE-RELEASE worldwide through ROCKSHOP ENTERTAINMENT (RSE) for their first ever box set, Decade: History Of Our Evolution, which will include 6 albums: Decade, Decade Acoustic, Decade 2, Decade 2 Acoustic, Decade Demos, and Decade Rarities. The band has also released the lyric video for their cover of legendary cult band FAITH NO MORE's "Epic", which will be available for immediate download with pre-order of Decade: History Of Our Evolution box set and is streaming below. 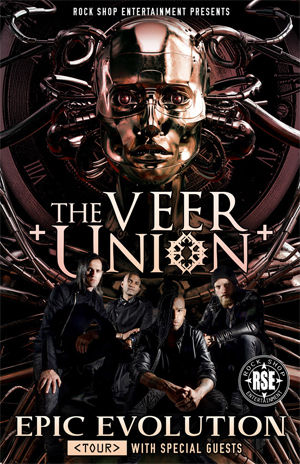 THE VEER UNION will also have pre-order bundles available 11/3 including: signed Box Set, T-shirt, hand-written lyrics sheet, private acoustic performance, VIP Meet and Greet, Free Show Entrance on their Epic Revolution Tour (see below), and Free Download of The Best Of The Veer Union 2008-2016 (including new acoustic recordings of their hit singles "Seasons", "Bitter End", and many more. As well, there will include reproduced, newly mixed and digitally remastered rock versions of “Seasons” and “Darker Side Of Me”. In 2016 Lead vocalist Crispin Earl took a rather unique approach to coincide with the concept of the album, Decade. He took the opportunity to reproduce five unreleased songs which were written prior to the first incarnation of THE VEER UNION in 2004, bringing them back to life, as well as combining five brand new songs to bridge the span over a DECADE. Now, with the BOX SET release of Decade: History Of Our Evolution, THE VEER UNION will continue this theme by Crispin reproducing the five remaining songs as well as adding five brand new songs again proving that THE VEER UNION can stand the test of time by incorporating the original vision of the band and blending it with the current incarnation. 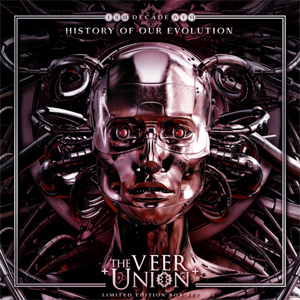 Decade: History Of Our Evolution truly takes the listener through a musical and emotional journey that represents all that is THE VEER UNION.